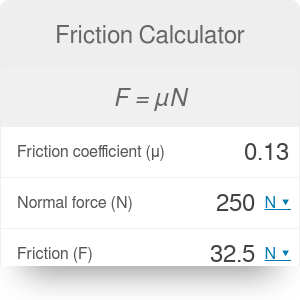 Use this friction calculator to calculate the friction force between any object and the ground. It is based on a simple principle: the friction is proportional to the normal force acting between the object and the ground. Learn how to apply the force of friction equation and what is the difference between static and kinetic friction. You can use this tool as a coefficient of friction calculator, too. N is the normal force (perpendicular to the ground surface), expressed in Newtons. Choose the normal force acting between the object and the ground. Let's assume a normal force of 250 N.
Determine the friction coefficient. We can choose a coefficient of friction equal to 0.13. Multiply these values by each other: 250 N * 0.13 = 32.5 N.
You just found the force of friction! Perhaps you want to check what work it performs? Static friction acts when the object remains stationary. Imagine you try to pull a heavy box. If we don't take friction into account, even the smallest force should cause some acceleration of the box according to Newton's second law. In reality, you need to pull quite hard for the box to start moving because of the static friction force. Kinetic friction acts on a moving object or, in other words, on an object with nonzero kinetic energy. If there was no kinetic friction, any object that you nudge (for example, a toy car) would never stop moving, as, according to Newton's first law, no force would act on it, so it would keep on going with a constant velocity. Even though the formula is the same for static and kinetic friction, you need to remember that the coefficients of friction are different. The coefficient of kinetic friction is usually lower than the one of static friction. Friction Calculator can be embedded on your website to enrich the content you wrote and make it easier for your visitors to understand your message.